Seventeen years an on-again, off-again journalist, more than ten years a fulltime cop, and Trey R. Barker’s new mystery series starts on day one. “…utterly believable,” is how Kirkus Reviews describes Trey R. Barker’s newest novel, Slow Bleed. Jace Salome is not a captain or chief of police. She’s neither a detective nor a sergeant. Jace Salome is not even a veteran officer. Jace Salome is a scared rookie starting her first night on duty. She is the newest jailer at the Zachary County (Texas) Sheriff’s Office Jail. That night, in front of her, an inmate who may or may not have touched children, dies violently. Is it self-defense, as the jailer who killed the inmate claims? Or is it the leading edge of a blistering west Texas sandstorm that might well erase the thin blue line? There are cops and questions on both sides of that line and Jace, lost in that sandstorm along with a jailer named Rory Bogan and a Texas Ranger, will be forced to decide exactly how she defines justice in both her head and her heart. “Unflinching is the word I like to use in describing Trey R. Barker’s Slow Bleed. A writer who walks the walk, Barker will show you the difficult and dark side of crime literature. Get the nerve to read him—you should.” —Craig Johnson, author of the Walt Longmire Mysteries and the basis of the A&E Network/Netflix hit series, Longmire. Barker is best known for his dark short fiction, as well as his explosive Barefield novels, also set in west Texas (2000 Miles To Open Road, Exit Blood, and the forthcoming Death is Not Forever, all published by Down & Out Books). With Slow Bleed, however, Barker expands his boundaries within crime fiction. Barker treads a deeper walk into the human heart. Not only is it about the crime and criminal, but also about the why of a crime. 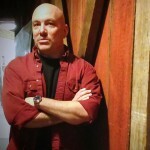 With over ten years in law enforcement, including his present duties as a sergeant with the Bureau County Sheriff’s Office, an Investigator for the Illinois Attorney General’s Internet Crimes Against Children Task Force, and a Deputy US Marshall for the Quad Cities Cyber Crimes Federal Working Group, Barker has seen that the worst crimes, the most painful, are frequently those that, superficially, have no wounds. Slow Bleed is available at online retailers and independent bookstores either in print or digital versions.